Purchasing foam tape to wrap around your air register dampers is a great way to secure them into your duct vent openings. 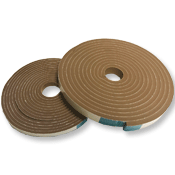 This adhesive rubber padding is available in 1/2 inch width (1/4 inch thickness) or 3/4 inch width (3/8 inch thickness), by 17 feet long rolls. Super firm foam tape is a great tool to use when trying to find a register to fit into an odd size duct opening in your wall or floor. Peel the adhesive rubber padding and simply place on the back of your floor or wall registers damper to create a snug fit. Imagine that you have a duct opening in your wall that measures 6 x 10 3/4 inches but the industry only makes 6 x 10 wall registers. Our adhesive rubber padding would be perfect for this job. You can use the foam tape to add some padding to the 6 x 10 register, which will then boost it to fit into the hole opening, creating that secure fit. 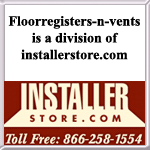 Note: This product will not work with any flat wall grilles or vents which simply lay over a duct opening. Order our unique foam tape today and prevent gaps between your oddly sized air ducts and newly purchased register covers.